So good news or bad news? Impossible to say really, it means he'll have had two days off so great from the energy perspective, but it's not like he's spent much time on the court this tournament so another match might have helped. Next up will either be Kei Nishikori or Jack Sock who also play today. Nishikori is the big favourite ahead of that one and he pushed Roger to five sets in Melbourne so he'll be a tough opponent on Saturday should they meet. What do you guys think? Is the withdrawal good or bad for Fed? Let me know in the comments. Katyani- well done to you and your team as well. A great week for you, no? Vik just a little bit better today, but still – you deserve lot of credit and you are great competitor, no? Thanks Alb… uhm… I… have… a team??? Honestly, I was not a BIT better, just better. Omg 3rd! I never think a WO is good, but I am no not Rog so he may ofc disagree.. not convinced who will win Sock/Kei but pick Rog to go thru whatever.. I also do not underestimate PCB.. hevys very solid and Stan is still very in and out. PCB had a good start to the year, best Spaniard after Nadal? Fed should make him short circuit though if they meet. BUMMER . Though im happy he’s in semis but im looking forward to this match.woke up to see this match. and its 1:30 am in the morning. Well you were right sometimes its good for roger to have a slighly difficult match to have a momentum.. dang……. Agree Susie. Stan is somehow winning when I don’t think he should. This could be a blessing in disguise. One more day to rest. Quite surprise by this, planning my day to see the match. Glad I wasn’t there paying big bucks for a ticket to this! Why? Stan is hard to beat when he has a few tough matches. The good news is that Fed will get a day off. The Sock – Nishikori match will definitely be a three-setter and as the winner will have to play a well rested Fed tomorrow, it is advantage Fed. The bad news is that my weekend is totally destroyed. Had declined so many party invites so as to watch this match and this Nick goes and eats poisoned food of all things. Yep, 16 time Grammy Award winner (47 nominations) Foster. To be honest, they’re terrible!! You can hear the autotune groaning to fix their vocals. That’s what I thought, Gaurav. They got a lot of help. No way Fed reaches that pitch. And Tommy was sounding very, very, professional. I think this video shows how One Direction had successful careers. Auto tune. Oke, first of all….what the hell??? Second of all….. why is you know who videobombing us?? Haha that videobomb is terrific! Poor Djoker can’t do a thing right in Fed fans eyes. Looking like one match for Swiss Wells as Stan is on top. Was really looking forward to that match. If Fed does get Kei next it could be tough, but the way Roger has been playing I think he is the favourite over Kei. Am going to buy some Lindt chocolates in case there is cause for celebration on Sunday! Cute Gaurav. David Foster is from my neck of the woods. He is Haas’s father-in-law. Actually, they don’t sound too bad. Foster their vocal coach? That’s pretty cool! Ever met him? Seen him lots but never met him. He used to put on a celebrity softball game in Victoria for charity. Produced a lot of music. Anti-climax really, good thing Roger post his One Handed Backhand video. Its cute and funny. Entertaining really. But was it forced or unforced…? Well, they are putting on a exo match Haas vs Pospisil. That would be fun. Telecast though? It was on ESPN3. I think you should be able to watch on replay. Not the best match even as an exo though. You’d be so much better off watching Pospisil/Murray. Stan is scraping some win as well. Don’t know if these opponents are good or not, but it’ll be intersting to watch Carreno-Busta/Wawrinka match. Pablo is red hot, but not sure if he is ready to beat Stan and eventually Roger. I think Kei looked sluggish, his feet weren’t as electric as usual. Oh! Thanks for that video! laughed so much and something I needed after the Kyrgios’ Fedeterror WO. The draw of death not lookin so bad now. I’m really disappointed about this news – I was looking forward to the match. And as a rule I don’t think walkovers do the other player any good, either – especially assuming it will be Kei on the other side of the net. I was trying to remember last time Fed had one. Fish at USO. But reckon I am missing some. 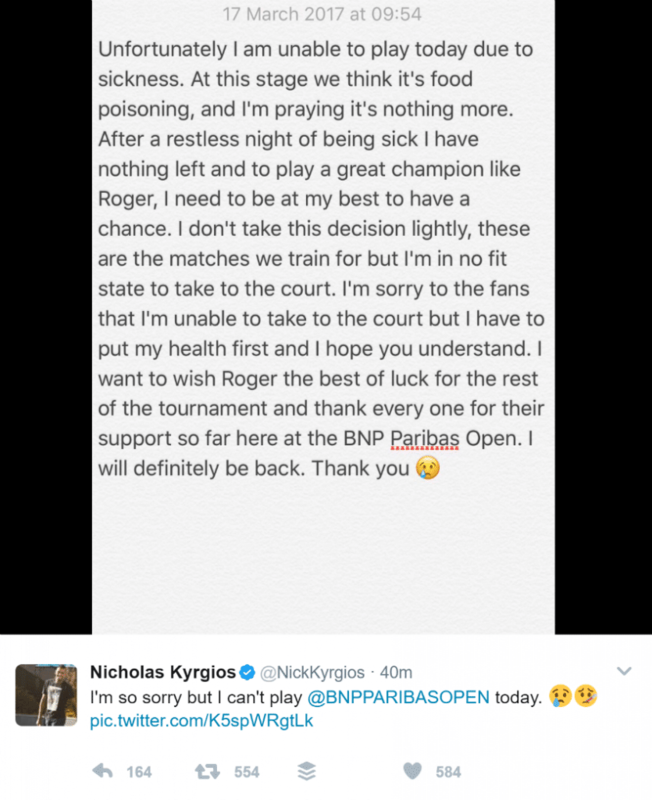 Kyrgios withdraws in the Nick of time, and preserves his winning H2H against Roger. Jack next hah! So much of the Group of Death. Went through my mind Sid, he wakes up unwell and risks a loss, so withdraws and perhaps Kei didn’t want to get another potential losing stat on his head to head either. Better Fed gets the rest & just treats it like a day off in a major, he has been on such a high and distracted by the boy band remake he probably can use more time to prepare. Stan looks tough and in form should they meet, anyway it shows we worry about the draws but lots can happen. Just enjoy it he is #7 and moving in the right direction. C’mon Fed! What was the reasons for Feds withdrawal last Miami? Preserve the H2H with Del Po? I have to say, I’m super impressed with Jack Sock’s game. I’ve always been a fan of the guy- always such a sport, often telling his opponent to challenge, donating points, and generally a guy with a really positive demeanour on and off the court. Seems he’s really upped his game. The doubles seems to have improved his net game, his movement looks pretty great. Should be a better match than I had earlier anticipated. Couldn’t be happier for the guy. Didn’t he tell someone to challenge in an Exho? Now he’s ultimate sports person. Fairly sure I saw a match lately where he was very petulant… I don’t mind Sock but more sporting than the average? Nah. It should be good match. Though the match against Nishi was a 3-setter, it wasn’t a physical battle and thus Sock should not be so tired. Imagine a final between Pablo Carrena Busta & Jack Sock. It will be the most ‘unpredicted’ final in the history of the game, I guess. I thought it was quite physical the Sock match. Nishikori looked slow. Sock not the fittest either. Watched most of the match Sock/Nishi. Impressed of Sock, too – and he might be crowd darling, too. What is your prediction, Jon? Fed in 2 I think. Well he did. Have you stats of your predicts coming true? Sock was dangerous though so Fed had a little luck to win the second set? Yes, I’m 100% over the last 8 years. Won around £50 million on betting on Federer matches so done ok.
Yeah Sock played well in second set, Fed struggled a bit tbh and was helped by Sock’s poor backhand in the tie break. Believe me Novak isn’t a bad guy. I remember standing and watching Fed and Novak walk by in Dubai and I shouted Go Fed and Fed looked straight ahead and as he was in his own zone I had no hard feelings. After the match, Fed was charming & patient taking time to sign so many autographs for more time that he took to win the match !!! However, following him was Novak and I shouted Hey Djoker to which he turned and gave me a big smile. Was not in the zone i think !!! Novak does not have the charisma which Fed has and wants to work hard at crowd acceptability. But the harder you work at it, the lesser your chances. Fed is a natural which Novak is not. Nobody really knows what any player is like as they’ve never spent any time with them. Djoker prob a nice guy. But just like Federer he has some seriously petty fans ? take a look on Twitter and they are constantly at each other trying to score brownie points with the fedfan or nolefam. I can understand 17 year old girls doing it and running off to their what’s app group to screenshot away but some of them are adults by the sounds of it. Well, nothing much to do since our man is not playing, so took to ruansblog and I have to say I am very disappointed in myself for even thinking that there could be a positive post in some time. “Finally, there seems to be life in this rivalry again. That hasn’t been the case since 2009 probably. Federer defeated Nadal with ease 6-2, 6-3 for s third straight time. He finally seems to have found the solution. One would have thought that the slower Indian Wells courts would favor Nadal but, of course, Federer has defeated Nadal at Indian Wells before. On that occasion, the score was 6-3, 6-4. The key this time again was Federer’s backhand which he is hitting earlier and cleaner. The rivalry is still heavily in Nadal’s favor and it seems that Nadal has declined before Federer even though there is a five-year difference in age but at least there is life in the rivalry again which is good for tennis. Against Nadal, Federer played as well as ever and as I have said a million times before he has declined very little if at all. The competition has caught up so he is not as dominant as he once was but he is playing as well as ever. If not better than ever. People come here and moan about his content, but based on that he must be doing something right ? It’s like an accident at the side of the road. You tell yourself not to look but you do. Personally, I don’t. I don’t think he is very hackable. Could win but seems unlikely. Am I the only one who doesn’t want Stan to win? All about Fed and who is best for him to play in the final. I am a regular reader of your blog for 5 years and here’s my first post. Have you noticed that the court speed is slower than last year in Indian wells ( from 30.0 to 27.3). Surprisingly, Miami is quicker than Iw at 33.1 last year. I always think Miami is slower and jumpy and Roger always did worser in Miami compared with Iw. I am happy for Roger to play well in slower courts. Moreover, court speed is not the exercise for fed haters and critics anymore. I want to know your thoughts about whether Roger should attend Miami regardless of win or loss in the final. Personally, I want to see Roger play more matches and earn more points which helps him in ranking. However, I am not sure his body can be in good form for three weeks, With Murray pulling out and novak’s potential out, I see a better winning chance there. But I also want to protect the record with Rafa, they are likely to meet somewhere and the condition may favour Rafa. Let me know your idea. Thanks for commenting. Kinda cool to.know someone read very often but never commented! I did see that about court speed. I actually meant to out the graphic showing it in my post but totally forgot. I always call Miami Slowami, certainly looks it on TV but Fed has said Miami is always the quicker court. Just conditions make it slower through air than in Indian Wells. Thanks Jonathan for your reply..
I’m an enthusiastic fan of federer since 2009. Honestly, I am a fedfan but not a tennis fan because I only watch federer’s matches (more likely a longtime fangirl) and will stop watch tennis until he hang up the racquet. Personally, I don’t quite know how to play tennis(tried before but failed cause it’s too physical for me) but I like to read every article and reports about federer. My knowledge about tennis grew up from my reading and what I have seen in those years and your blog also contributes to it. The reason I don’t comment is largely because I don’t have much insightful ideas and my English is not quite good. This year’s AO win reignited my interest for Federer. I mean I used to accept he is past his time and possibly won’t win slams anymore and I just wanted to see him more. However, I have high hopes for Roger to win more ( maybe 20) now. I always tried to watch Roger’s live match in AO and this year I watched him every match by person except the final. It’s one of the biggest mistake and regret in my life. I gave the final ticket to my friend just because I was afraid to see him lose to Nadal again in the live. Two heartbroken match in 2009 final and 2013 semifinal stuck into my heart, I was crying both times and was under the weather after that for the whole week… Thanks for Roger proving me wrong this year and teaching me a lesson. Never give up . Thanks for listening my story – a fangirl’s story. In the future, I’ ll continue to support your blog and post my thoughts if I have. Thanks for your commitment and hardwork to this blog. Cool. Your English seems fine to me. But no more niceties as I cannot believe you gave your final ticket away :S crazy! Yes I knew silly and crazy I made that decision. I was born in China and had never seen Roger in any Slam matches in the field until 2009 when I moved to Australia. That Final match was legitimately my first Roger’s match on the spot except Shanghai’s master. That lost was unforgettable as I could feel his deep disappointment and sadness on the scene when he cried on the speecch. I mean before this I saw a lot loss to Nadal I can always told myself it’s just sport and good luck next time. But when you really saw the scene and felt it by person, the feeling was just so real and deep. The bad memory showed again in more brutal way in 2013 AO semi-final where Roger was thrashed by Nadal in straight sets. At that time, he just changed his racquet and did a master performance against Murray which gave me a lot of hope. However, when I really saw he had a tight first losing in tiebreak, and then quickly wilted in the second and third. I can’t keep remained any good aspects of his play. I knew I shouldn’t blame him but it’s just a pity he can’t find a solution and was not the same person I saw him thousands times in front of other opponents. The above two slam losses just made me a coward and I told myself never looked back and sort of gave up Roger whenever he played Nadal. OMG, I wrote such a long reply with no meaningful stuff. I hope you won’t feel too bored. I think I have reinsisted myself as a Roger fan rather than a tennis fan by personal story which my boyfiend alway accused me of being narrow-minded and fan fever. Sharing your personal passion and honesty about it makes a very nice impression on me and for sure others here as well. Do tell your boyfriend to be less narrow-minded about your “fan fever” – this is a thing to be happy about, really! It seems like no one saw their first video with their real voices. Godawful. This was totally auto-tuned. And, btw, One Direction have excellent voices believe it or not. For pop singers of course. Haha come on man, do they ever sing live? It would have been tough being in the stadium for the 09 AO final. I’d be crying too. Shake hands with U, Sue and Muser. Usually I’m quite easy with win or loss because I’m naturally pessmistic about things( I mean I always consider the worst result before I do something so that I have cushion against any failure or disappointment). However, in those kind of matches I really want roger to win as well as I see the high chances( the closer it is, the harder feeling I have to take). However, I believe I have grown up a little bit(I used to dislike Nadal a lot because I dont appreciate his stye and he always beats Roger in that physical way). But in recent years watching his decline(especially his hair potentially to bald) leaves me sympathy and signs for him. I feel quite luck to choose the right person in the beginning tennis journey and I can see Roger more years while winning the big titles. Thanks for commenting Sheng Gu. And don’t worry about your English! Roger always has something to teach us. I think I have known you and your id for quite a long time. Do you use this name in other forum or blogs? I am a regular reader of Tennis.com, Blue moonball and the old Ruan’s blog before he changed to Novak. I also used and commented on Bleacher Report tennis section and Atp website before they updated commenting areas. There are a lot regular and frequent IDs in my mind recent years. BTW, I believe it’s a wrong decision for Tennis.com to change from Livefire to Facebook. Facebook is supposed for family and friends(social life) rather than sports disscussion. Now I missed a lot of people in Tennis.com and some of them seem gone somehow. I am feeling a bit upset about it just like bleacher report changing its forum. Yes you’ll find Sue on AdultWork under the same nickname. I’d never heard of Blue Moonball before, just visited it, who runs that? I wasn’t quite sure what I was looking at, it is like a Tumblr, has thousands of comments though. I believe that blog was run by someone with the ID called “Blue Moon”. He was not showing up not very often in the thread or I didn’t watch him a lot joining the discussion. Most of people on that blog come from Tennis.com. They sort of gradually don’t like Tennis.com and moved to this blog discussing and commenting. The discussion base is growing larger and Federer-driven(Nadal is also likeable compared with Novak). I love that blog because most people there seem well educated and insightful and have the same preference(federer). Suing for slander….better lawyer up, J.
Sheng Gu, there are many Sues, Susans, etc. And how do you know this, J. Past experience?